What type of procedure does Precision Heat & Air, Inc. use to clean my system? We use high velocity compressed air along with a high volume vacuum system to dislodge contaminates and pull them from your home. We use specially designed air whips, air sweeps and rotary brushes designed to ensure proper removal of contaminates. All grills, registers, diffusers and plenums are cleaned and sanitized. After the cleaning, an EPA approved sanitizer is fogged through the system. This sanitizer will kill mold, bacteria and fungus. 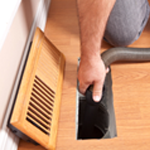 To help ensure a clean, healthy environment, we recommend that air ducts be cleaned every 5 to 7 years.